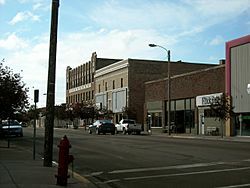 Glasgow is a city in and the county seat of Valley County, Montana, United States, with an estimated population of 3,414 as of 2015. American Indians inhabited the region for centuries, and extensive buffalo and pronghorn antelope herds provided ample food for the nomadic tribes. 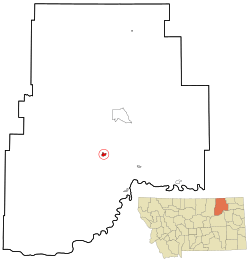 The Nakoda, Lakota, and Dakota peoples alternately inhabited and claimed the region from the 16th to the late 19th centuries. In 1804 the Lewis and Clark expedition came within 15 miles (24 km) of the future site of Glasgow and noted the extensive herds of buffalo and various game. In 1851, the US government formed the first treaty with the Native American tribes, in 1885 the tribes engaged in the last known buffalo hunt in the region, and in 1887, a treaty was signed where the tribes surrendered 17,500,000 acres (7,100,000 ha), which led from 1888 to the formation of the Fort Peck Indian Reservation and the removal of the tribes from the Glasgow area. Glasgow was founded in 1887 as a railroad town by James J. Hill, who was responsible for creating many communities along the Hi-Line. The town was named after Glasgow in Scotland. Glasgow grew during the 1930s when President Franklin D. Roosevelt authorized the construction of the Fort Peck Dam, which became a major source of employment for the Glasgow area. During World War II, the Glasgow Army Airfield housed the 96th Bombardment Squadron and 614th Bombardment Squadron, flying B-17 Flying Fortresses, at different times during the war. Starting in December 1944, a German POW camp was established at the facility, lasting until the end of the war. After the war ended the base was closed, and part of the facility eventually became the present day Glasgow Airport. Glasgow was the death place of Lieutenant Colonel Ronald Speirs, famed member of Easy Company, 101st Airborne. In the 1960s, the population rose to about 6,400 due to the nearby presence of the Glasgow Air Force Base, (SAC air command and housing B-52 bombers) used during the Vietnam War and the earlier part of the Cold War. 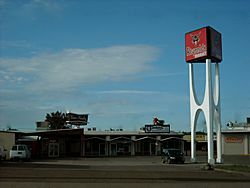 A significant amount of mid-century modern and Googie-style architecture was built in Glasgow at this time, much of which survives. After the de-activation and closure of the base in 1969, Glasgow's population declined to about half its one-time size by 1990, when the loss rate stabilized. Glasgow currently functions as the major regional administrative, shopping and services hub for Valley County and some of the areas beyond. Glasgow is located at (48.198252, −106.635402). According to the United States Census Bureau, the city has a total area of 1.43 square miles (3.7 km2), all of it land. The town has an elevation of 2,093 feet (638 m) and overlooks the Milk River Valley. Glasgow experiences a continental semi-arid climate (Köppen climate classification BSk) with long, cold, dry winters and hot, dry summers. Tornadoes are a rare occurrence. Two F2 tornadoes did however, hit the Glasgow area on June 25, 1975. As of the 2010 census, there were 3,250 people, 1,479 households, and 834 families residing in the city. The population density was 2,272.7 inhabitants per square mile (877.5/km2). There were 1,653 housing units at an average density of 1,155.9 per square mile (446.3/km2). The racial makeup of the city was 91.8% White, 0.2% African American, 4.5% Native American, 0.3% Asian, 0.4% from other races, and 2.7% from two or more races. Hispanic or Latino of any race were 1.8% of the population. There were 1,479 households of which 26.6% had children under the age of 18 living with them, 43.5% were married couples living together, 9.1% had a female householder with no husband present, 3.8% had a male householder with no wife present, and 43.6% were non-families. 39.7% of all households were made up of individuals and 19.6% had someone living alone who was 65 years of age or older. The average household size was 2.13 and the average family size was 2.85. The median age in the city was 45.6 years. 22.7% of residents were under the age of 18; 5.2% were between the ages of 18 and 24; 21.3% were from 25 to 44; 28% were from 45 to 64; and 22.7% were 65 years of age or older. The gender makeup of the city was 47.8% male and 52.2% female. The median income for a household in the city was $35,504. 14.5% of the population were below the federal poverty line, compared to 15.1% for the USA as a whole. Glasgow is on the Hi-Line of the BNSF Railway and is served daily westbound and eastbound by Amtrak's Empire Builder route. Glasgow is served by Glasgow Airport and has daily commercial service to Billings. Glasgow is located on U.S. Highway 2, which is a major east-west traffic corridor of the northern Great Plains region. Montana Highway 24 passes nearby the city, a major north-south route connecting southern Montana to Canada. No Interstates run near the region. Glasgow, Montana Facts for Kids. Kiddle Encyclopedia.